I wonder why it was for just one year? Maybe another way to get taxes out of them rich motorists..? I knew a man who drove a 25T pickup. He was the original owner. He had a drivers license which he got from Sacramento on the back of a postcard. It said "good until revoked" He never did apply for another license. I knew him in the 1950's. Well, technically it's a 1925 license--or actually, part of 1925 and most of 1926. neat find, Jay--but a bit far from California! (where it's currently raining like Noah's flood! This is an original 1919 Michigan Driver's License. The material is linen, and folded over from the outside, the inner 1/2 page is still quite white as linen should be. Michigan's first driver's license application was on June 30, 1919... (Up to that date there was law requiring licensing on private autos)...by then Gov. Albert E. Sleeper, the day before the law went into effect. 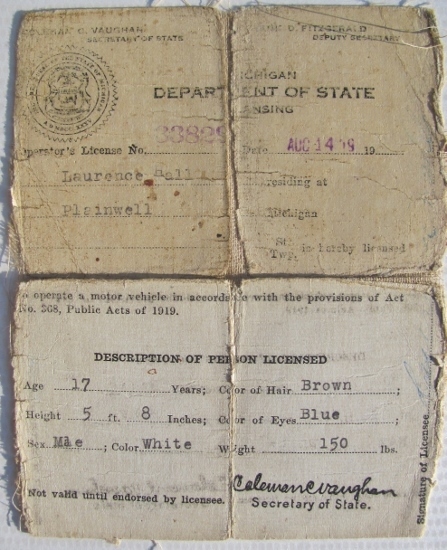 That first license was on a linen-backed paper, 4 1/2" x 5 1/2". It had no expiration date, and required no renewal. Drivers applied for it at local police stations or the State Capitol in Lansing. In 1931 the state passed new law requiring drivers to renew their licensed every 3 years. 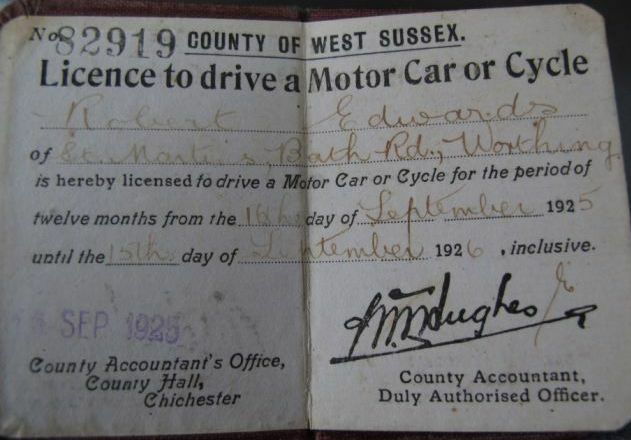 The above license is dated Aug 14, 1919, since the law started on July 1, 1919, this one is rather early. Old and tattered from being carried for years by the driver.